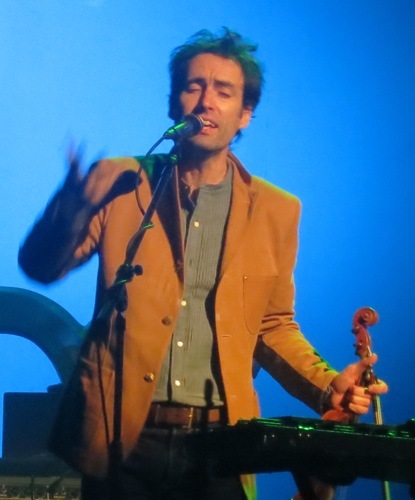 Andrew Bird hasn’t been back to Milwaukee since his stint of two shows there in 2009, so he was greeted by a very enthusiastic crowd at the Riverside Theater on Saturday night. He emerged on the stage with a new addition to his many-layered outfit, a red hat, another nod to the fact that this is yet another tour where Bird is going to spend the majority of it being ill. As always, though, his performance didn’t suffer noticeably for it as he led his band through a fifteen-song main set and two encores. Much as he did in Nashville, Bird devoted the middle portion of his set to an unplugged jam session, his band clustered around a single microphone off to the side of the stage. It didn’t have the same historical connotations as it did in the historic Ryman Auditorium, but it still sounded amazing. “Effigy” got a huge round of applause, which seemed to momentarily stun Bird. It’s interesting that “Effigy” has been one of the songs from Noble Beast that’s sticking around in concert for now, but it’s got a very well deserved slot on the setlist. He also included a cover of a Townes Van Zandt’s “If I Needed You” in the old-timey section, which he said had touched him recently. It’s a very folksy, heartfelt ballad, perfectly suited for the acoustic session. Of course, I would be remiss not to mention the repeated false starts that hit the beginning of “Plasticities” towards the end of the show. “My finger got stuck,” he said after flubbing the opening notes the first time. After missing it the third time, he pointed out that “you get a couple of do-overs and then it gets awkward. First it’s funny, then it’s awkward.” I enjoy the fact that he acknowledges these things — it’s like he’s letting us in on a secret, and it makes the very, very few mistakes that he makes somehow more endearing. He pulled it together and went on to offer up an outstanding rendition of the song, one which ends with the members of the band crouched on the ground, manipulating their various knobs and pedals to bring it to a close. As usual, he closed out the show with “Tables and Chairs” and “Fake Palindromes”, which are two of the best songs off of one of the best albums of all time. I’m always struck by how different these songs are from their recorded versions. The Mysterious Production of Eggs is a sleepy little album, but live, these songs have a life of their own. “Fake Palindromes” in particular is performed with a new level of swagger that I haven’t really seen before out of Bird. There’s a lot of confidence in his performance of that song, and he knows he’s got the audience right in the palm of his hand for the duration of it. He ended the evening with a cover of the Handsome Family’s “So Much Wine”, and the Charley Patton tune “Goin’ Home’. Both were acoustic, around that old-timey mic, and while they were great renditions, I’m pretty sure that the audience missed the entire point of the first song. (I have lots of thoughts about the audience in general, but I’m keeping them to myself.) Bird came back for a second encore, taking the stage alone to perform the always-moody “Weather Systems”, leaving the audience to bathe in a swirl of bowed notes and the soft tones of the glockenspiel that sound more like wind chimes, gently clanging in the breeze.